In October 2016 after months of hard work the Rotorua Canopy Tours team implemented phase three of their pest trapping programme in the Dansey Road Scenic Reserve. In the lead up to phase three of the pest trapping programme, Rotorua Canopy Tours guides fought their way through the dense native forest cutting and marking trapping lines ready for the Goodnature humane traps to be installed. A24 rat traps were installed every 50 meters and A12 possum traps every 100 meters throughout the 7 km of prepared trapping lines. 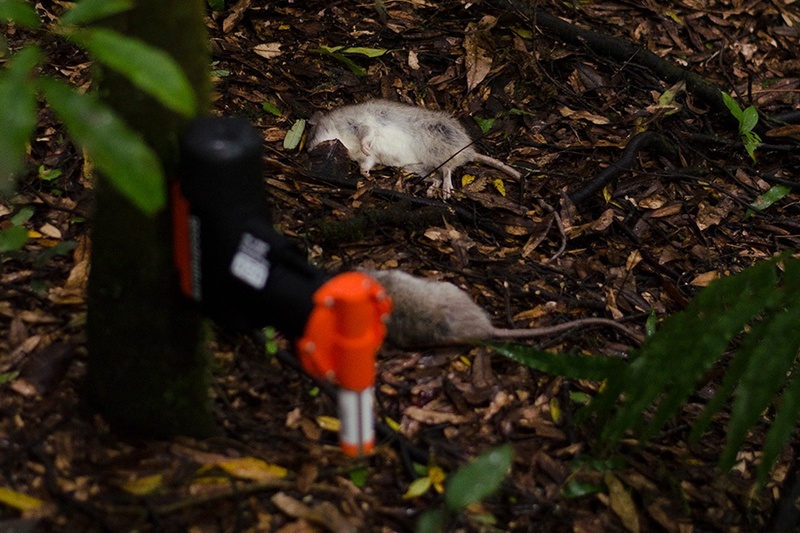 Photo: Two large rats caught by Goodnature's A24 rat trap in the Rotorua Canopy Tours trapping programme. The new technology Goodnature traps self-reset, powered by a CO2 canister the possum trap is able to catch 12 possum and the rat trap 24 rats. Each time the trap is triggered the internal spring re sets the trap ready for the next pest to take the bait. This trapping method has proved to be a success at Rotorua Canopy Tours with a huge reduction in the numbers of pests found in the reserve, and the increase in native birds moving into the 'safe zone' that has been created. Including phase three, Rotorua Canopy Tours has 180 ha of the Dansey Road Scenic Reserve under pest control, this consists of 650 traps up and down 22km of trapping lines. The traps are a mixture of Goodnature A24 rat and A12 possum traps as well as Doc 200 traps. 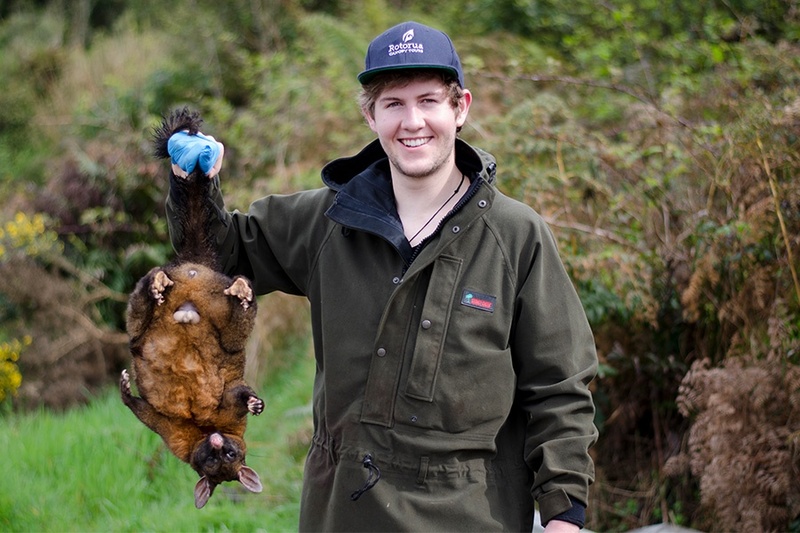 Photo: Rotorua Canopy Tours Guide, Spencer with one of the possums removed in phase three. On Monday 10, October the phase three traps were set and left for two nights then the Rotorua Canopy Tours team headed into the forest to see what had been caught. The team removed 91 rats and 14 possum from the 22 km of trapping lines which is a great result! Most people are unaware of how destructive rats really are in our native forests, with the ability to have 12 pups every 12 weeks it doesn’t take long for the numbers to get out of control. Rats are not fussy eaters either and eat almost anything; including the bird’s eggs and chicks from the nest. Thanks to the Goodnature traps which are always working through out the DRSR the pest numbers will continue to reduce, increasing the 'safe zone' for our native birds and we will start to see more life in the forest. Without the constant pressure of rats and possums browsing the forest, eating the trees, insects and birds the recovery incredible. Trees are now seen to flower and the canopy is lush and green; insects become common and fulfill their job in the ecosystem and provide food for the birds that in turn got to enjoy a safe breeding season again this year. Rotorua Canopy Tours will continue to expand the pest control in the DRSR until the entire forest is save and brimming with happy native species and a healthy forest. Click here to find out more about Conservation & Eco Tours in New Zealand.